« Trek. Sleep. Eat. Repeat. That’s how Reinhold Messner, in his book “Everest: Expedition to the Ultimate,” described his sensation after he and Peter Habeler became the first men to summit Mount Everest without the use of bottled oxygen in 1978. At 29,035 feet, Messner was lucky he could draw a couple of breaths. The air is so thin at the top of Mount Everest that, without proper acclimatization, he could have passed out and died in 15 minutes flat. 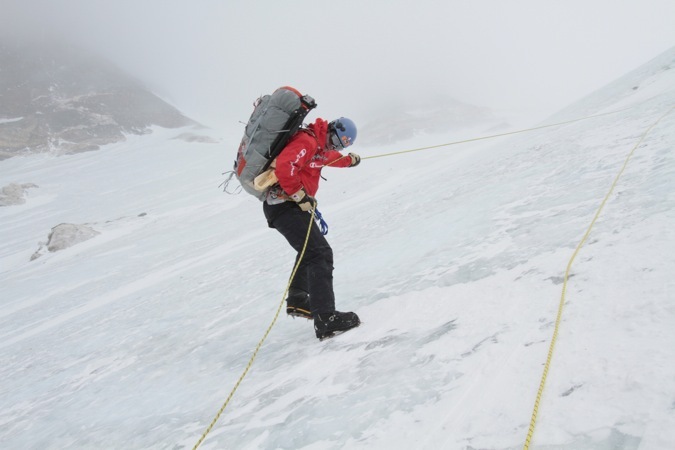 Aside from wearing oxygen tanks, which wouldn’t necessarily save their lives, how do mountain climbers avoid death by thin air? If you’ve ever followed an expedition, you’ll notice that climbers spend as much or more time going down the mountain as they do going up. As masochistic as mountaineers may seem, they don’t ascend and descend for fun. This process, known as acclimatization, is a very deliberate, slow, and steady way to prepare their bodies for the hazards of high altitude. At sea level, we live under what the medical website altitude.org calls “a huge ocean of air that is several miles deep: the atmosphere.” As you climb a mountain, the air becomes less compressed and contains fewer molecules of oxygen. 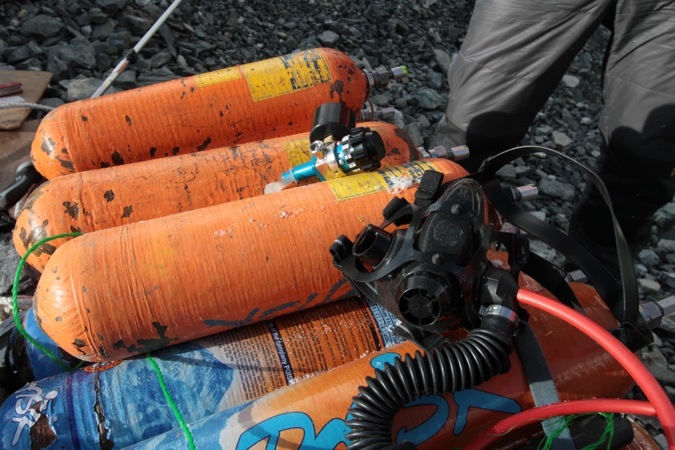 At 9,000 feet, there is 75 percent of the air pressure there is at sea level. 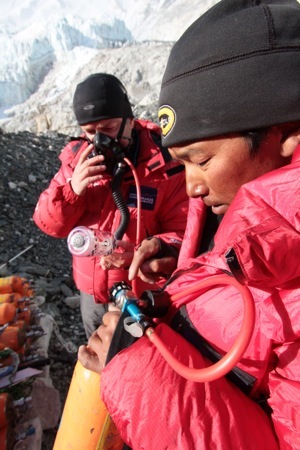 At 18,000 feet—just between Camps I and II on Mount Everest—there is half. At the top of Everest there is one-third. The first, and most common, is acute mountain sickness. 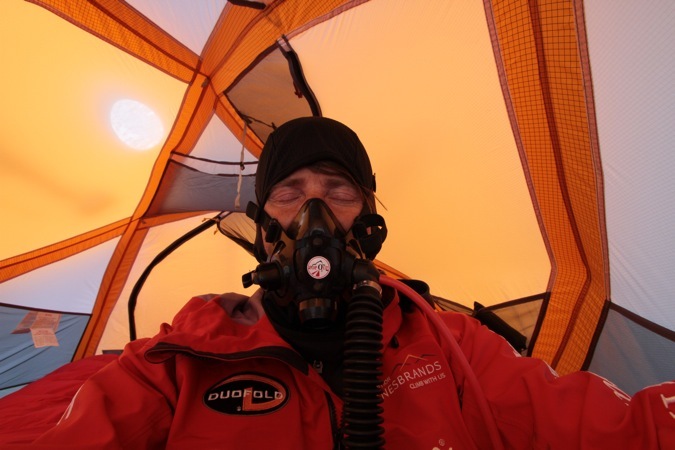 At an altitude as low as 6,500 feet you can feel dizziness, nausea, headache, lethargy, and poor sleep. These side effects, which feel a lot like a hangover, are most likely the result of a slight swelling of the brain, which causes a slight increase on the pressure in the skull. 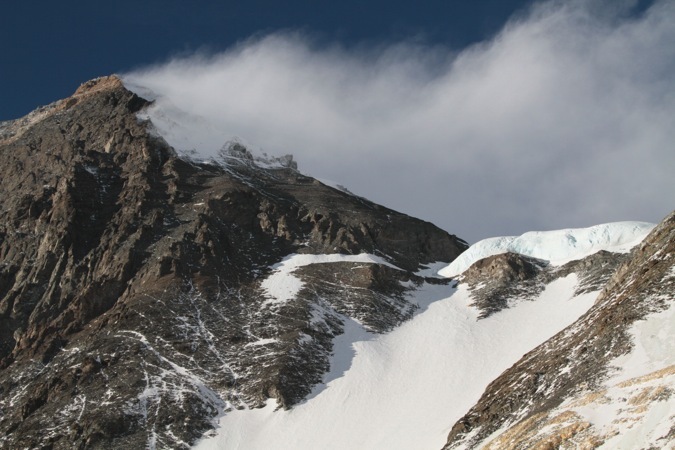 High Altitude Cerebral Edema (HACE), which can occur anywhere above 9,000 feet, is thought to be a severe form of acute mountain sickness with similar, albeit more severe, symptoms that may ultimately result in a coma and, eventually, death. High Altitude Pulmonary Edema (HAPE), which can occur anywhere above 6,500 feet, is a build-up of fluid in the air spaces between the lungs that can cause oxygen shortages, which can be fatal within hours. HAPE symptoms can include blue lips, an elevated heart rate, breathlessness, frothy sputum, and the sensation that you are drowning. HAPE and HACE are both very rare, but the tricky part is that no one can predict who is most susceptible to these potentially fatal conditions—even the most physically fit climbers can be at risk. On the world’s highest peaks, everything above 26,000 feet is known as the “Death Zone.” That’s the point at which there is not enough oxygen in the air to sustain human life. 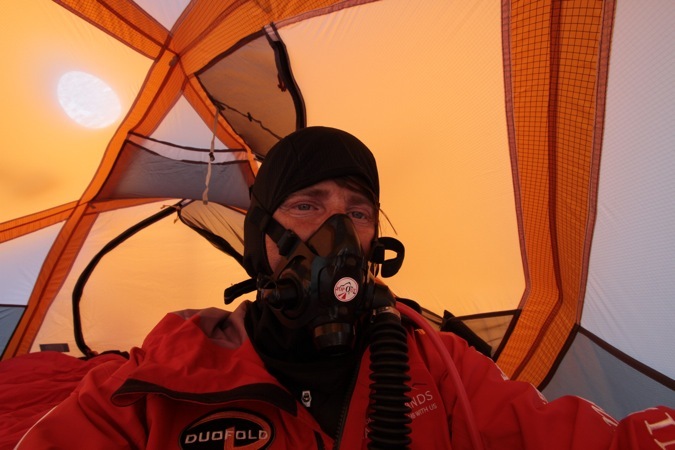 Even acclimatized climbers have a very short window of time above the Death Zone before they will die of hypoxia (lack of oxygen). 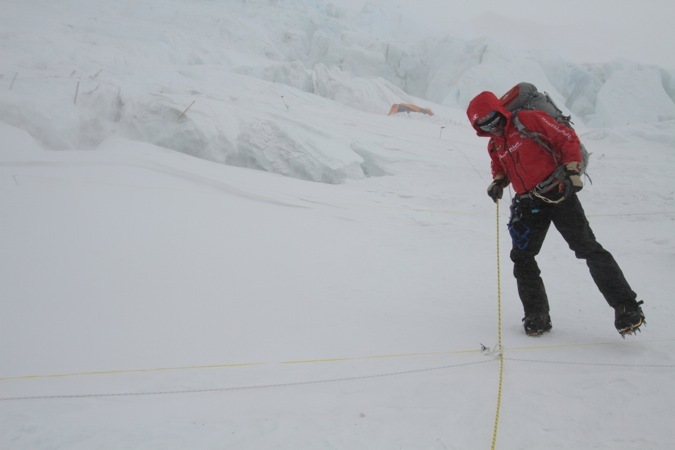 To combat these potentially deadly illnesses climbers, like Jamie Clarke, have to be patient and allow their bodies to slowly adapt to higher altitudes, applying what’s known as the “climb high, sleep low” principle. 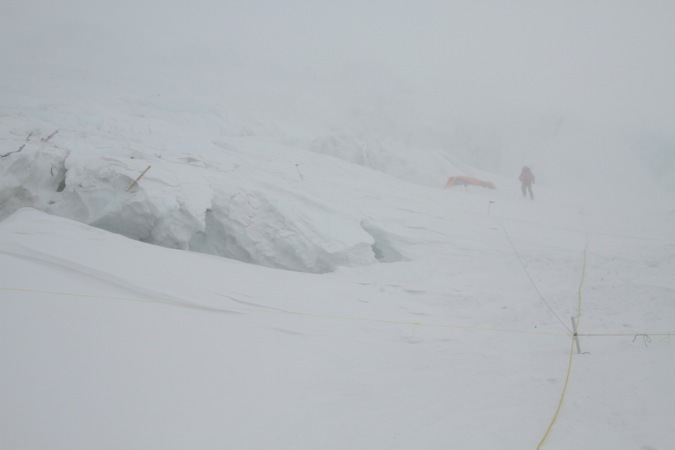 First Clarke and Simper climbed through the Khumbu icefall. 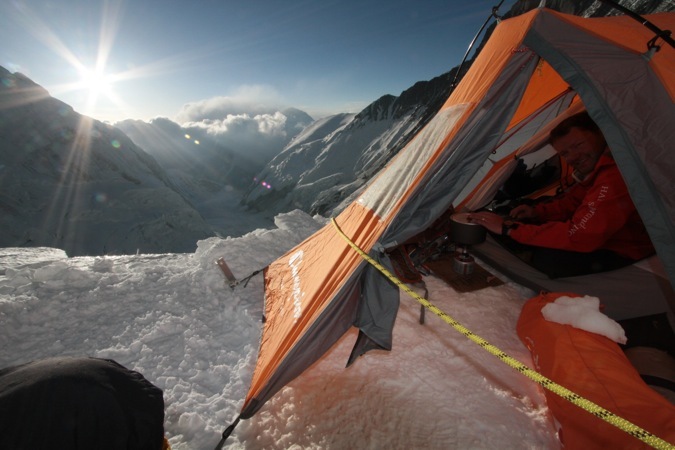 A day later they climbed to Camp I, at 20,600 feet, and spent the night there. 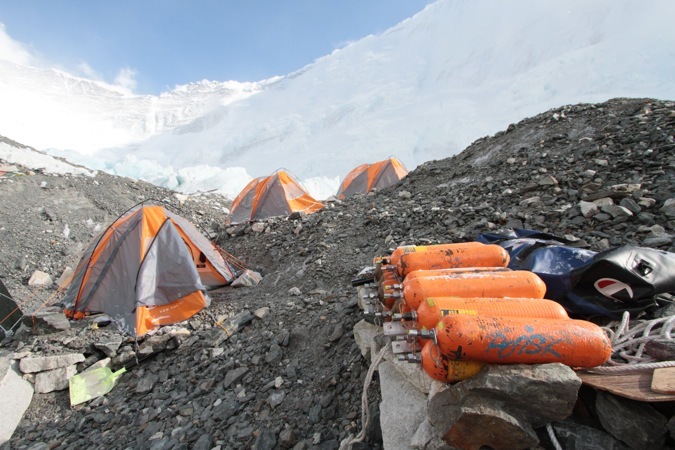 The next day they returned to Base Camp, then climbed back to Camp I, where they spent two nights, then carried a load of gear to Camp II, at 21,400 feet. They returned to Camp I to sleep, then moved to Camp II, where they spent five nights. 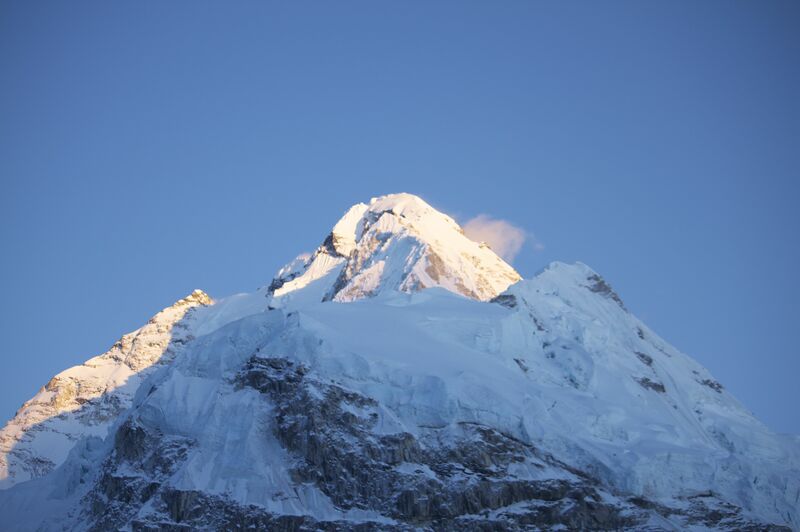 After a rest day, they climbed to Camp III, at 23,600, descended to Camp II to sleep, then returned to sleep at Camp III for a night before returning to Base Camp to rest and wait for good weather for the summit push. If they don’t summit within two weeks of this cycle, they’ll have to repeat the acclimatization process over again. 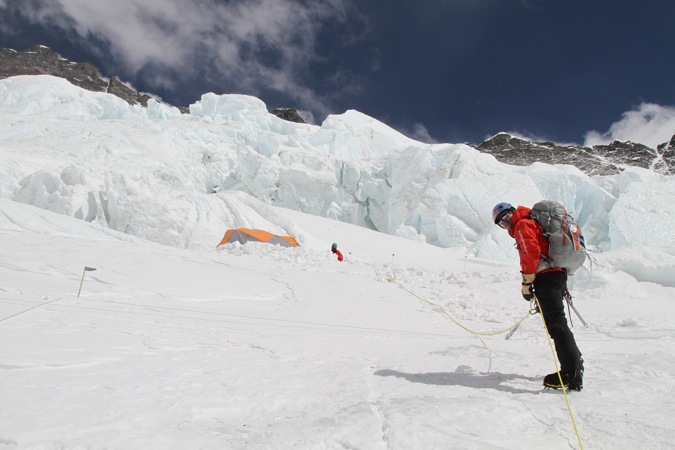 The tricky part: Really experienced climbers want to minimize their time on Mount Everest to 40 days because if you stay at high-altitude much longer than that you’ll lose too much muscle strength to effectively climb. folks consider issues that they just do not realize about.